I think I might be the least enthusiastic bride out there. At least, that's probably what the staff at the store I bought my gown in thought a few weeks ago. They wanted to know if I wanted to try it on when I went in to pick it up. I politely declined, and from their reaction, I think I might be the first bride in the history of the store to do so. The truth is, I should probably lose at least 10 more pounds to look GOOD in my gown for my fall wedding. Although I've finally reached my pre-pregancy weight, I have yet to reach my ideal wedding weight. But a new, quick and delicious cereal is helping me with my battle. Fibre 1 Almond & Cluster Delight is as healthy as it is tasty. It's quick to prepare during the morning rush AND one bowl is 40 per cent of the daily-recommended fibre intake. To be completely honest with you, this is the first "healthy" cereal I like. Usually the cereals I pick up have cartoon characters on the box (and these are for me, not for my daughter). Although, since becoming a Mom and questioning everything I offer to Hannah, also makes me question what I am putting in my body and if the foods I eat are doing everything they can. Fibre 1 Almond & Cluster Delight fits the bill - quick, tasty, healthy. The almonds are definitely my favourite part - I know I will be eating this cereal WAY past my fall wedding date. From now until June 25th (while supplies last) fans will have the chance to scoop up one of two coupons redeemable on either July 16th or July 23rd. July 23rd coupon redeemable for Nature Valley, Fibre 1 bars, Golden Grahams OR Cinnamon Toast Crunch treats! More information available on General Mills’ Life Made Delicious page. How do you add fibre to your diet? 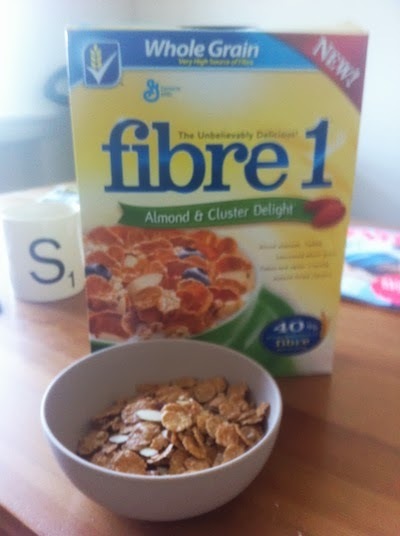 Disclosure – I am participating in the Fibre 1 Almond & Cluster Delight Cereal blogger campaign by Mom Central Canada on behalf of General Mills. I received compensation as a thank you for participating and for sharing my honest opinion. The opinions on this blog are my own.